Anna Wigley was born in Cardiff in 1962 and has lived there, except for one year in London, ever since. Her parentage was a mixture of Welsh, English and Lithuanian. She studied English at Cardiff University and then stayed on to do a PhD on the novels of Iris Murdoch. 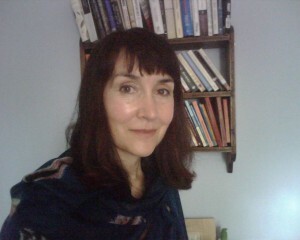 While a postgraduate, she began submitting poems to magazines such as New Welsh Review and Planet, as well as reviewing books for those publications and for Poetry Wales. She also wrote articles and in 2000 won The Guardian essay prize for a piece on D. H. Lawrence. In 2001 she won the Geoffrey Dearmer Prize, and in 2002 her first collection of poetry, The Bird Hospital, was published by Gomer Press. In 2004 a first collection of short stories, Footprints, came out; then in 2005 another book of poetry, Dürer’s Hare. Her most recent collection is Waking in Winter (2009). In 2011 she was given an award by The Society of Authors. Anna also writes for children and has just self-published a book called The Salon of Eternal Youth with Amazon. She has also brought out a second short story collection, Roses have Thorns.